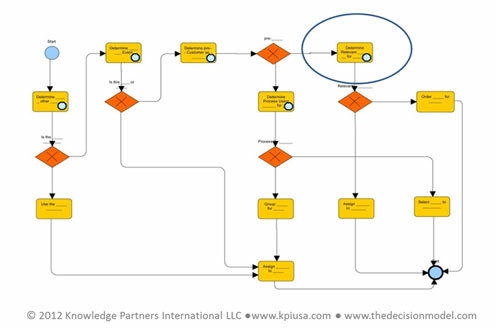 The Decision Model finds its way into organizations in many different ways: through a Center of Excellence, a pending crisis or opportunity, an inspired individual, or a small investigative group.Regardless, all paths to organizational decision modeling encounter a common question: How do you introduce The Decision Model into an organization? More specifically, how do you gain management attention for delivering decision models as a standard practice? This month’s column addresses that question. In essence, a management presentation on The Decision Model has four goals: (1) confirm the advantages and disadvantages of your organization’s business rule practices (2) introduce The Decision Model as a significant advancement to overcome the disadvantages, (3) explain how easy it is to interpret a simple decision model and, most important of all, (4) present in step by step fashion, a decision model built from real business rules within your organization.Nothing helps an audience grasp a new concept as much as showing precisely and simply how it applies directly to something they struggle with. Your decision model will solidify the tangible advantages of The Decision Model related directly to your organization’s struggles. If your organization’s reaction is similar to others, your model may be the beginning of a revolutionary shift in business governance. It is of utmost importance that you tailor the presentation to your organization. You will need to do some preparation. The first preparation task is to identify current business rule practices in your organization, including advantages and disadvantages. These will be the common ground on which the presentation starts.The second preparation task is the most important. It is to produce a decision model diagram using as input a current set of business rules. It need not be a complicated decision model diagram. However, it must begin with the decision octagon. The decision octagon raises awareness beyond the idea of individual business rules to the more strategic level of an entire business decision. The decision model diagram must also contain at least one complete logic branch. In other words, at least one logic branch must end with all conditions below the dotted line because the values for these conditions are provided as raw input. This reveals the fundamental connections within a decision model and how a decision model exposes its level of completeness. You must also create one or more Rule Family tables for your decision model populated from your business rules. There is no need to create all of the Rule Families, a good sampling will do. These ensure that the audience connects with the decision model structure through its content. Additionally, create a corresponding business glossary, although it can be a partial glossary. The intention is for the audience to welcome the business glossary as a business-friendly non-technical artifact that also serves the technical audience. Finally, to put your decision model in proper business context, create a decision-aware business process model in which it would execute. Your process model will illustrate that decision models improve business process representation and execution. 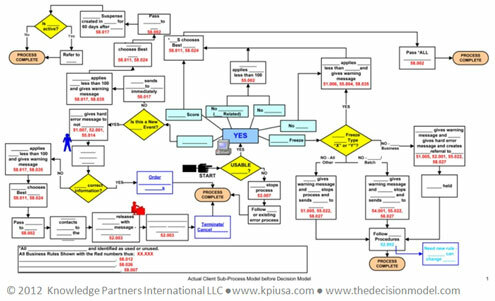 You may want to get buy-in during preparation from process modelers because decision models will have a very constructive impact on process models. Figure 1 contains a well-practiced agenda. The remainder of this column presents details behind each part of the agenda. It provides a general description of Parts 1 and 2. 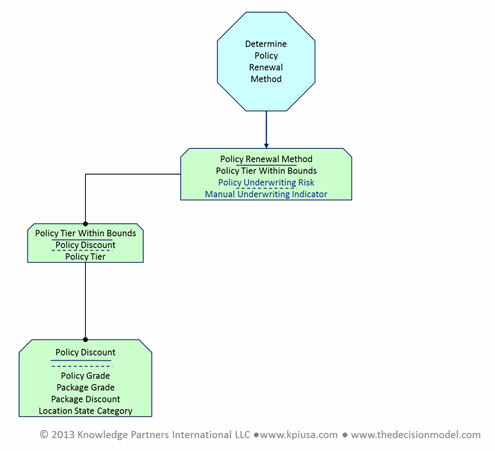 It goes into more details for your decision model in Part 3. 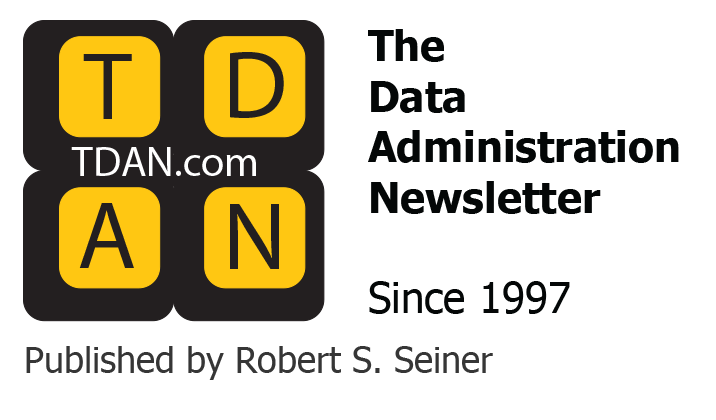 It suggests important points for Part 4 so that the audience grasps the full vision for adopting decision modeling as a standard practice. Part 1: Current Business Rule PracticesAs indicated above, Part 1 starts by discussing how your organization manages business rules currently. This creates a common ground of familiar struggles. It is important to assure the audience that your organization is not alone. Its business rule practices are similar to those of other organizations. For your reference, the table below contains the most common current practices. However, your presentation should focus on those of your organization. In preparing for your presentation, study the common advantages in the table below. Yet, present only those pertaining to your organization’s success stories. Common disadvantages are listed below, but, again; present those most familiar to your audience. Part 2 introduces The Decision Model by stating that it arose precisely because of the universal disadvantages across organizations. There had to be a better way. 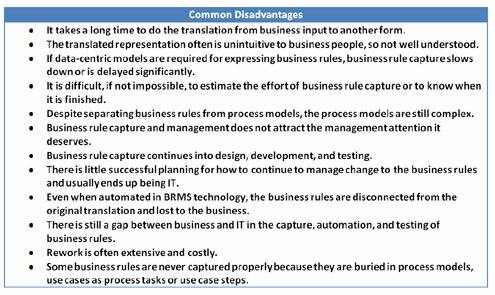 This part of the presentation should confirm there has been little success in the universal separation of the “business rules” dimension from all other dimensions of a system or business process. It should point out that this is not for lack of trying. These frustrations have existed for decades. 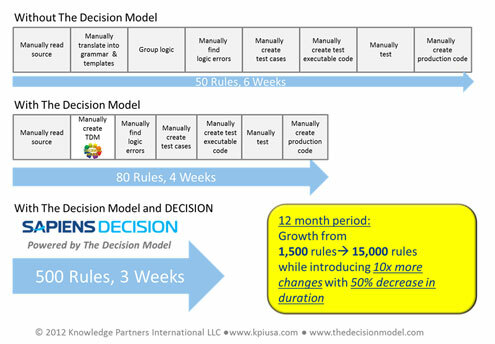 The Decision Model as the solution, is not simply just another change in business rules approaches. It is a completely new (and simpler) way of thinking about them. Part 2 instructs that The Decision Model turns “business rules” into “business logic” based on rigorous but simple principles. Business logic is nothing more than correlating conditions to conclusions in a specific manner. So it is very easy for all audiences to understand. There are no special classifications of business rules and no special grammatical syntax. Further, The Decision Model materializes natural connections among tables of well-formed business logic. These connections create a precisely-defined, predictable model-based configuration that is easy to understand. It is no accident that each decision modeler, given the same input, will produce the same or similar representation! The result is that The Decision Model delivers a significantly more successful, higher quality, strategic, and business-empowered solution. Part 2 also makes a comparison between two kinds of process models. One is a common business-rule-oriented process model pointing to lists of business rules. The other is the new world of a decision-model-oriented process model pointing to entire decision models. By comparing these process models, the audience observes first hand, a tangible and radical difference. The complexity of the first compared to the simplicity of the second is startling in good way. 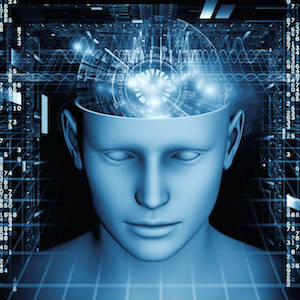 The audience will realize that decision models have an uncanny way of streamlining business processes. There emerges a clean separation of process models and decision models resulting in greater business agility. Part 2 describes the decision model diagram and simple examples of business rules turned into business logic in Rule Family tables. Part 2 ends by specifying the many ways other organizations are already using decision models in large production systems. Examples are below. The important point is that The Decision Model is no longer a new idea and its adoption is spreading across all industries with unprecedented success stories. Once the audience has an understanding of The Decision Model and its adoption, they will be curious about its usage for your organization. Part 3: Your Example This is the most important part of the presentation. We use a fictitious example below, but you should use your example. The idea is to leading the audience through the following: current business process model, current business rule capture, your decision model diagram, Rule Families, business glossary, and decision-aware business process. Below is an explanation of how to step through the topics using our example, so you can plan how to do so for yours. Start by sharing a business process model for your example and explaining how it relates to corresponding business rules.2 Figure 2 is our example of a business process model relating to business rules. In our process model, most business rules appear as pointers leading to a business rule repository. The business rule repository could be a requirements tool, or MS/Office document. Other business rules appear as activities in the process model. In fact, parts of some business rules appear as process activities. Misrepresenting business rules or parts of them as process activities is commonplace when process models relate to business rules and not to decision models. Your business process model may relate to its business rules in some of these ways or in other ways. Regardless, remind your audience that business process models unaware of decision models are unnecessarily complex. They render the business rules invisible and disorganized. Now they see it in their own environment. Next share your selected business rules in whatever format they currently exist. Because the most common format is a business rule spreadsheet, our example includes one in Figure 3. It resembles many we have seen in that it contains textual business rules, organized in a project-specific fashion. This business rule spreadsheet purposely contains common suboptimal business rule practices for illustration purposes. Use business rules in your example and point out similar suboptimal practices. Let’s walk through some from our example. Figure 3: Sample Business Rule Spreadsheet with Suboptimal PracticesIn Figure 3, the Rule Texts take on various forms. There is an if/then statement for Rule Numbers 537 and 1024, a when/then statement for Rule Number 543, and process instructions for Rule Number 63. 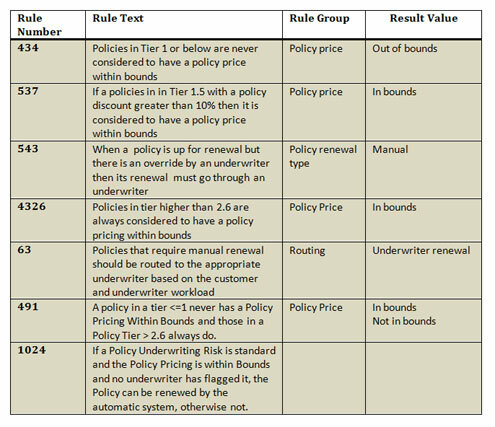 The Rule Group column sometimes indicates a conclusion reached by the Rule Text (e.g., a conclusion for Policy Price). Sometimes it indicates a type of rule (e.g., a routing rule). Rule Number 491 is actually more than one (atomic) rule indicated by the “and” connecting different conditions to a different conclusion. Rule Number 1024 is also more than one atomic rule. Its use of “otherwise” is a way to avoid specifying the “otherwise” conditions. Unfortunately, this leaves them up to interpretation. Rule Number 1024 overlaps with 543. In many cases, a business rule spreadsheet also contains a column for the corresponding snippet of program code for the Rule Text. Imagine the surprise when sometimes the code doesn’t accurately reflect the Rule Text. Perhaps this mismatch existed from the beginning. Or maybe subsequent updates made it so. Also common is a business rule spreadsheet containing a column for the related error message. Believe it or not, sometimes the message does not match the Rule Text. In some cases, it may not even match the code snippet. To be fair, business rule capture in some organizations have more rigor than those in Figure 3 and therefore have fewer of these issues. However, regardless of format, business rule capture and maintenance is error prone and tedious. If this is true for your example, point these out, especially those that led to extensive rework. For the next step, make the transition to your decision model diagram. Figure 4 is a partial decision model for our example showing two Rule Family tables based on business rules in Figure 3. Use your business rules as the basis for a similar diagram. Point out how your decision model diagram “matches” the content of Rule Families. Also point out how the decision model diagram indicates the presence of logic branches through the role of supporting Rule Families. 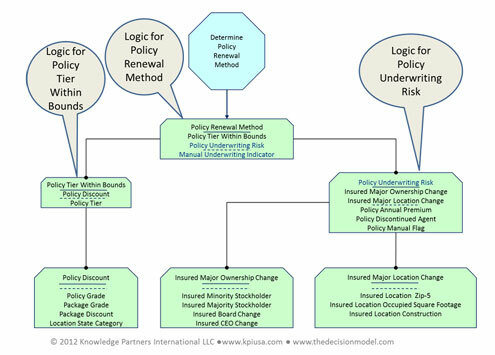 In our example, Figure 4 indicates the need for two branches of logic: one for Policy Pricing Within Bounds and another for Policy Underwriting Risk. Figure 4: Partial Logic Branch for Business Rules from the Spreadsheet.Figure 4 shows only part of the left logic branch and that there is one more Rule Family (i.e. Policy Discount) for it. Therefore, Figure 5 shows the completion of the left logic branch because the bottom level Rule Family shows all conditions below the dotted line. At this point, walk the audience through the activity of adding a logic branch until your decision model diagram is complete. Let’s do so for our example so you can see how to do so with yours. Figure 5 contains one logic branch but needs another for Policy Underwriting Risk. Searching our business rule spreadsheet (or better yet, working with underwriters), this risk considers whether the Policy Holder has had any changes sufficient to increase risk. What kinds of changes are these? These are changes in location and ownership. So, Figure 6 contains a branch for all of these supporting Rule Family structures. Annotate your decision model diagram with callouts or other graphical notation to highlight the orderly arrangement of connected Rule Families. Remind the audience that this arrangement results from decision model principles. In Figure 6, the bottom level of both branches ends with Rule Family structures where all conditions are below the dotted lines. So, the values for these conditions are raw input data; there is no more logic (i.e., no more rules) for this decision model. The decision model is complete. Using your decision model, point to the Rule Families where all conditions are below the dotted line. Remind the audience how easy it is to determine, from a decision model diagram, when a decision model is complete, or how incomplete it is. Figure 6: Decision Model Diagram with Another Logic BranchFigure 7 shows a more complex example, based on a real-world scenario. This one represents a decision to determine eligibility for disabled student allowances. 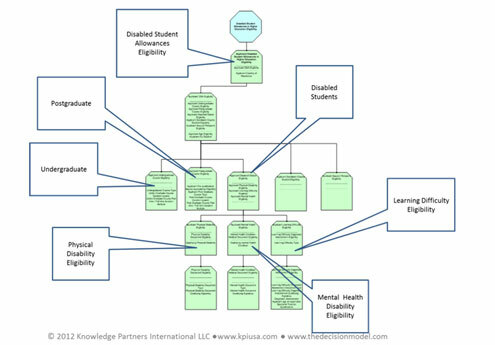 The callouts illustrate how nicely the logic organizes into branches for undergraduate, postgraduate, physical disabilities, mental health disabilities, and learning difficulty disabilities. Maintaining the logic for all of these is straight-forward with the decision model representation. Figure 7: Real-World Decision Model Diagram for Disabled Student Allowances Eligibility. It is important to introduce a business glossary for your decision model because it reinforces the glossary as a tool for business audiences. Review the business-friendly names, definitions, and a full set of values for some column headings. Figure 8 contains a partial business glossary for our example, but yours will be for your example. Figure 8: Sample Partial Business GlossaryThis is the point to announce that there is absolutely no need for object models, data models, or fact models to define, populate, validate, generate test cases for and execute test cases for decision models. The business glossary items have business names, without concern for how these items exist in software or databases. Instead, decision modeling focuses entirely on business people specifying their business logic in the way they intend it to be, correct, complete, and minimally redundant. Also important, though, is that the business glossary is the glue connecting the business audience to the technical audience. The business audience governs the business logic while the technical audience automates it. When a decision model is targeted for automation, a technical professional cross-references to data models and object models. But this connection happens after the business specifies and tests the logic in vocabulary that they understand. At this point, revisit the project-specific business process model, this time explaining that it is simpler because it is aware of decision models. Figure 9 is our example indicating how a process task connects to an entire decision model. Again, include your decision-aware process model. Note that the clean separation between process and decision models enables one to change without changing the other. Emphasize that this clear separation is possible only when the process modeling and decision modeling happen together and not independent of each other. Part 4: Wrap UpYour audience has now seen the potential for significant productivity and quality improvements with decision models. It is a good place to share real-world statistics. As a result of The Decision Model and its independence of technology considerations, organizations achieve productivity and quality in business rule management never seen before. Figure 10 contains statistics for a real-world project in a major organization with several years of decision modeling experience. The top bar in Figure 10 represents productivity numbers resulting from their original business rules approach. The second bar represents productivity numbers when they replaced business rules with decision models, but without supporting software. The third bar presents even greater productivity numbers when using software for creating decision models, finding logic errors, generating and executing test cases (all without object models or data models). Often business rule capture and management leads to dependency on a vendor or technology. Even so, change management can be very time, resource, and cost intensive. With decision models, this is different. Not only are decision models devoid of technical considerations, the principles result in logic structures that can execute in any current or future technology. This means one decision model can deploy to multiple technologies. 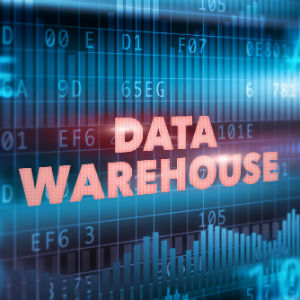 Newly available software products allow an organization to repurpose decision model content to any execution system with little effort, offering technology and vendor independence and future migration paths. From Figure 10, the audience may begin to imagine a new world. In this new world, non-technical people create, validate for logic errors, and test decision models without needing object or data models and prior to turning them over to IT for automation. This is a ground-breaking reality, closing the gap between business and IT. With The Decision Model the business becomes self-sufficient regardless of technology. The business creates decision models in exactly the same way whether those models deploy to a policy manual for human execution, to home-grown software, to a commercial engine or to multiple automation environments. Once your audience understands this shift in business governance, pause for a moment. Then, revisit from the beginning of the presentation, the disadvantages of your organization’s current practices. Ask the audience which of these disadvantages disappears with decision models. 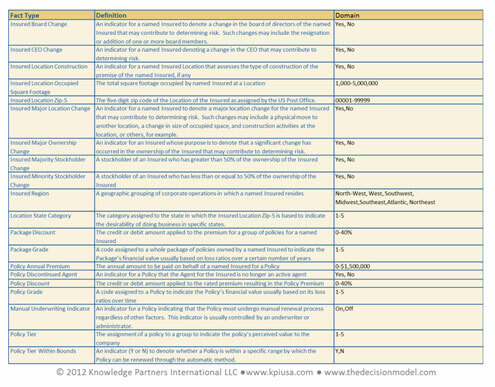 Elaborate on how The Decision Model differs from their current approach as seen in its advantages below. Finally, present a graphical representation of current practices as in Figure 11. It shows a process model that is not decision-aware and a set of business rule spreadsheets, partly or mostly maintained by technical people. Present the changes in Figure 12. It contains the simpler decision-aware process model, decision models, Rule Families, and error-free tested business logic, governed by the business. At the end of the presentation, leave the audience with the following four thoughts. The Decision Model delivers business logic as a living business asset governed by business people. There are no risks in delivering decision models. 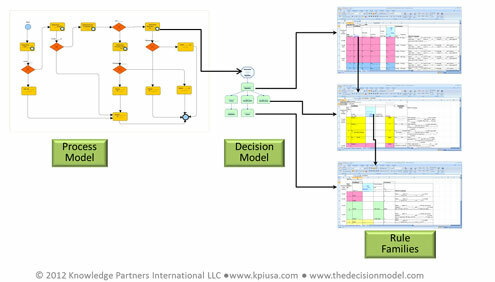 At a minimum, an organization creates decision models in MS/Visio and MS/Excel using free templates from www.kpiusa.com. Technology-driven organizations evaluate supporting software up front. Either way, decision models fill the gap that has never been filled before. 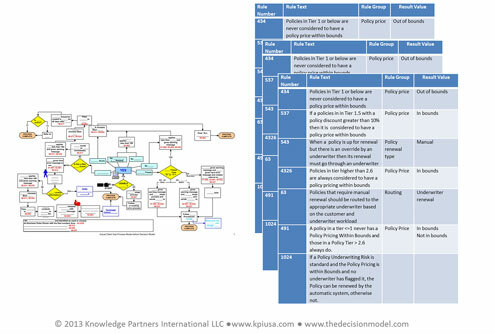 von Halle, Barbara and Larry Goldberg, The Decision Model: A Business Logic Framework Linking Business and Technology, © 2009 Auerbach Publications/Taylor & Francis, LLC. If the target project does not have a business process model, start with how the project captures business rules, described in the next paragraph.